I’m writing this week’s devotional while on vacation in Italy. Being in the military for the past 21 years has not been without cost. Having been now converted for about 17 of them, I’m often ostracized for my Faith. Especially now since becoming a chaplain in the past 3 years, I’m persona non-grata…often most among other chaplains. I’ve had many jobs in my career. More than most. I’ve lost friends to enemies like Al-Qaeda, ISIS, local middle-eastern dads planting IEDs to feed their families, suicide, drugs and dangerous living. I’ve missed many birthdays and anniversaries in my military career, even the birth of one of my four kids, but the life’s also had a lot of advantages. I’m likely to retire by age 45 having earned the right to then work in the ministry for peanuts till I’m taken home. Moving every few years always carries hopes for new people and places. My wife and I have had the privilege of serving in many great churches around the world. I also consider it an advantage (though there are surely disadvantages) of having been built in the Faith by no one pastor, denomination or local church tradition. My in-depth training came at the hands of hundreds of authors I’ve never met. I finished my seminary in Iraq and Afghanistan online. Most of my discipleship, especially in my earliest years, was by long walks with a mp3. As with many in this more digital age, God has built me “outside the camp” for nearly 17 years now. It’s been a long road since I enlisted in 1998. I’ve deployed four times. Only one of my real friends from my high school years is still alive and he’s barely that between jail sentences. God’s been extremely good to me. I’m now stationed in Germany. I’ve got to see many parts of the country with Wittenberg as the highlight, with the first time being late in October of 2017. But I’ve not only been able to see Germany. So far, I’ve gotten to see France, Poland, Lithuania, The Czech Republic, Switzerland, Luxembourg, England and Italy with plans for several other parts of Europe before we leave. And we do most of it as a family with four young kids! So, while it sometimes feels a bit like taking a DMV experience with us on the go, we make it work. And we surely don’t post all of our pictures on Facebook. No one wants to see the meltdowns. 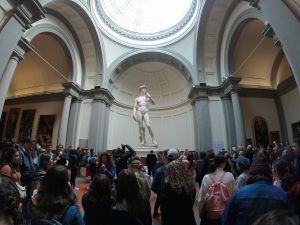 A few days ago, I saw Michelangelo’s Statue of David in Florence. It was iconic, amazing, and wonderful to see. It totally dominates the room it’s in standing at over 20 feet tall on its pedestal. The achievement of a man carving such a thing from one large solid rock is monumental. The details. The size. The care that it must have taken to cut, sand, shave and polish it is astonishing. No doubt, to create something like that must’ve been quite satisfying. Just the other night I walked the streets of Florence alone along the Arno River where men like Michelangelo, Dante, Leonardo Da Vinci, numerous Medici family members, Galileo, Donatello, Machiavelli, musical composers galore and many more must have walked. 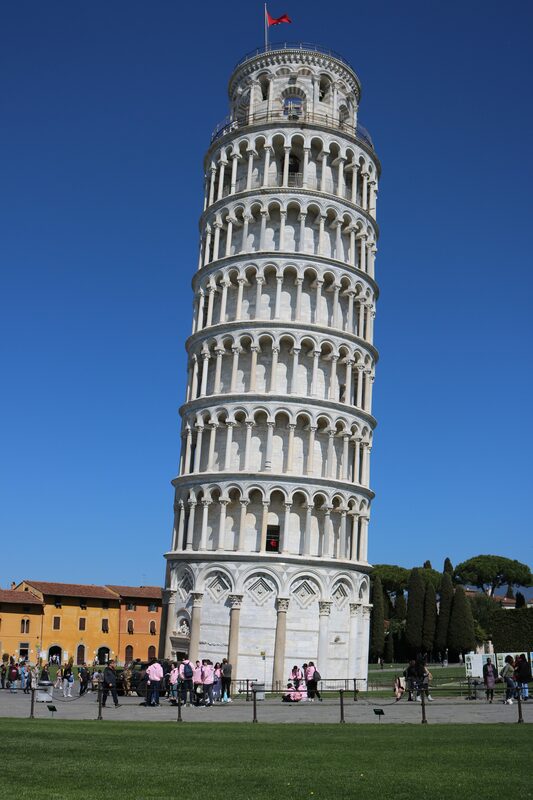 I climbed the leaning tower of Pisa, saw the church with Leonardo’s Last Supper painting in Milan, rode a gondola through Venice and more. What a time. What a privilege! And who cares? I’m writing today to remind that only that which is done for Christ will last. Everything else is fading. God has given man the desire to create. It is our creator’s prowess we poorly model with our kids, books, sculptures, paintings and songs. All beauty is God’s beauty just like all truth is God’s truth. No matter where I travel, whatever sites I walk in, or things I see, they all leave me wanting. Jesus said I’ll see God one day in Matthew 5:8. With that ahead of me, everything else is simply lacklustre. I leave places feeling empty. It was a door, a painting, a building, a hillside, a church, an ocean. That’s it. I see it now as evidence of my being remade for another world yet to come. By the same faith as my father Abraham, I too move along in life, “…looking forward to the city with firm foundations, whose architect and builder is God.” Hebrews 11:10. I’ve taught my kids that people are much more valuable than places and that God is much more valuable than people. The triune God is first. Forget everything else while you remember and celebrate all you do for God’s renown and worship. The world is God’s. Its every true pleasure was designed by him. God and see what you’re able. It’s a privilege to. But remember, for the believer, there are so many much greater things ahead. Seeing God will never disappoint. No one will walk away from him wanting for more or feeling let down.